His fox-like atmosphere charms all others, hiding an evil intent behind his entrancing smile. His is so powerful that with a stroke of his fan, he can set the world aflame that burns day and night. Tamamonomae has arrived in Heian-Kyo! To learn more about this mysterious, and powerful spirit, let's take a closer look at the inside story behind the making of Tamamonomae. Tamamonomae is unique and distinctive. He has a rich story and a charismatic personality. Tamamonomae is based on a powerful fox spirit from Japan's folk legends. When designing this character, we retained his multiple tails and the great power he wields. 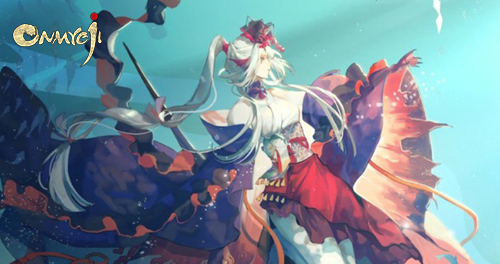 However, aside from these fundamental settings, Tamamonomae in Onmyoji is quite different from his counterpart in traditional Japanese culture. In the story of Onmyoji, Tamamonomae and Kuzunoha, Seimei's mother, are close friends. Therefore, Tamamonomae has a key role in the future plot, in turn revealing more about Tamamonomae's character and his eventual fate. Seimei's mother, his lost memory, the resurrection of Orochi… how does all this have to do with Tamamonomae? We wanted Tamamonomae to possess an entrancing beauty that attracts all souls to him, but at the same time destined to lead him to tragedy. The challenge we faced during early development is developing a mysterious atmosphere surrounding him, making him unfathomable yet attractive. However, the tales of Tamamonomae are already well known and he has been adapted in many games and anime, this adds to the difficulty of making him a character of surprise and mystery, since many users already have their first impression about this legendary spirit imprinted. Our biggest design inspiration for Tamamonomae comes from Kabuki (a classical Japanese form of theater where female roles are often played by men), especially the famous Bando Tamasaburo. Since the Tamamonomae in Japanese culture is very famous and popular, he is well studied by people, depriving him of his mysterious nature and the sense of strangeness that we were aiming to establish. We designed Tamamonomae's clothes in the style of the Edo period, using traditional materials available then. Although mixing in some modern elements would give a more attractive visual design, this would be at cost of sacrificing the mysteriousness, therefore we decided to restrict the design to a specific period, which would help increase the sense of mystery. Due to Tamamonomae's importance, we spent 3 and a half months working on his design, including countless hours of discussion. When building a 3D model for a character, our main job is to reproduce the base illustration as much as possible. For some characters, these illustrations look great but cannot be modeled properly, therefore we sometimes need to discard or alter some of their features to keep them consistent to the overall style of the game. Some of the illustrations are also quite dynamic, but due to the structural limitations of the models, we are unable to reproduce these moves in the modeling stage. We are also sometimes required to reduce or simplify some of the more artistic details to improve the performance of the game itself. Without this performance optimization, players would find their mobile devices overheating or significant framerate drops during gameplay. For overall planning purposes we try to keep our designs simple from the outset to optimize modeling and the animation. Although the artistic experience is important, we believe smooth gameplay is more significant for players. Tamamonomae's appearance is that of a powerful heavenly fox master bearing both masculine and feminine traits. The Initial plan for Tamamonomae's skills is that he would be a unique damage-dealing SSR shikigami, whose image changes when he uses his skills, depicting his ability to adapt to changes on the battlefield. After further discussion, we basically pinned down some of the design concepts but also began to realize that changing image mid-battle was too complicated and tedious, as well as going against his image as a steady high spirit. Therefore, we decided to depict his image change to the evolved graphics and his bio. During the early development stages, we actually had two different concepts for Tamamonomae. The first and the one we ultimately chose was a full-on damage dealer, while the other was a controlling shikigami, with the ability to seduce and confuse enemies. However, we felt that seduction and confusing enemies did not properly reflect his image as a high spirit and failed to show his status and true power. So the team decided to focus on making him a strong damage dealer. The professionalism of the voice artists we've worked with has been impressive. Whatever their characters are saying, and whether the scene is tragic or comical, the artists take their work extremely seriously. We are often in awe by the voice-acting of the artists, it has always been an amazing experience to listen to them recording on the scene. Many of the shikigami voices in Onmyoji are the voices of the professional voice actors. Many of their roles involve acting on many different levels, from true joy to complete despair. Since Tamamonomae is a mysterious character wearing both male and female clothing, we believe Romi Park, whose voice is equally charismatic whether she is playing a male or a female character, would be the perfect pick for this character. And that's all for the inside story behind the making of Tamamonomae! Hope you enjoy! For more information, please stay tuned to our website and Facebook page.